In my interviews I ask readers about their mom’s cooking but this is the first time that one of the moms answered the questions too. I think you’ll enjoy this discussion with Rachelle Rosenberg Isserow, mom of Miriam Isserow. Rachelle has lived in Jerusalem with her husband Saul since 1995. They’ve been married for 55 years, and have two daughters and 5 grandchildren in the US. 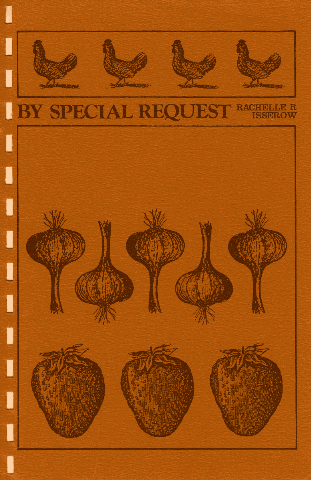 Rachelle also wrote a cookbook, By Special Request. What do you remember about family meals and your mother’s cooking style when you were growing up? My mother, who was Hungarian, cooked very European.No grilled steaks but good chicken and pot roasts. She was big on vegetables. Cold soups were a specialty as well as various vegetable and egg scrambles. Tuesdays was always a dairy meal of noodles and cheese. Meals were always formal with tablecloths and cloth napkins even on weekdays. She made us delicious cottage cheese and watercress sandwiches for school lunches. She was conscious of the need for nutritious food even though we had chicken fat and bread for snacks. She was an amazing baker attempting the most complex cakes such as dobos torte and jelly rolls that were light as a feather. Though a slight woman, she made outstanding white challah that she kneaded vigorously by hand. Her dairy cheese Danish and poppy seed rolls were ready for breakfast on a Friday morning. How is your cooking style different from your mother’s? I am much less involved in cooking and baking and have been known to buy pastry. I like store-bought challah better than most homemade. How did you learn to cook? I learned by helping my mother even at the early age of 10. She was a patient teacher who loved cooking and so was able to transfer her enthusiasm to me. I later developed my own style. There were few kosher restaurants in Boston so all women started to master the art of cooking. No takeout until recent years. I have hardly done takeout, except for pizza or burgers on very rare occasions. Can you share a typical daily menu? Weekly menu? My husband and I have breakfast, lunch and supper together, almost daily. He has his cereal, fruit and milk while I have toast and coffee. No sugar! For lunch we have sandwiches and salads. Supper is left over form Shabbat till they run out and then we eat out. I love to eat out! Shabbat is very elaborate. First course is fish or a kind of meat such as kebab with salads and soup, either vegetable or chicken. Meats are usually both chicken and beef, if we have guests. I make sure to have beef if we have students. I owe then that. I try for asparagus or broccoli even out of season. Dessert is fruit pie (my own crust dough) and brownies or something chocolaty. No more mousses or fussy stuff as most of our friends are careful about weight and too much sugar. Of course there is wine (red and white) and teas of various kinds. I always have a fresh fruit platter with nuts and mints. Essentially, I think of dinner at our house as an elegant party, complete with table setting and flowers. Most important are the interesting guests and good conversation. A d’var torah (short educational or inspirational speech) on Shabbat is our centerpiece. How has your cooking style evolved over the years? I cook more simply, using fresh veggies and fruit. I fuss less and never make vegetable puddings except for potato kugel. Our starch is rice pilaf, farfel or couscous. Of course, in the winter there is cholent (stew) or stuffed cabbage. These are great for leftovers. Can you recommend any cookbooks, TV shows or websites that have inspired you? I am a Julia Child fan of the old days. I watched her show regularly and really learned a lot. She lived in Boston so we bought fish in the same market in Brookline, MA. Now I like Aharoni but never make his stuff. He does give me ideas. By now, I have most of those recipes in my head. I never use any cookbook but my own. I refer to the cookbook for baked stuff, only. I cook only what I know. What is the most unusual dish you’ve ever made? Salmon Couloubiac from Julia Child. What a job! I made it only once for visitors form Israel. I was then pretty young and foolish. What is the oldest item in your kitchen? The newest? Everything is old around 1954.I do have tablecloths from my mom’s trousseau which she monogrammed herself in 1931. I just bought a new 2-cup measuring cup. It’s a red see-through plastic and dishwasher and microwave proof. What would you like to change about your cooking style in the coming year? Not much really. My style works and has stood the test of time. I don’t think my friends want me to change my style. It changes with the seasons with the holidays, with my whims. Please share a favorite recipe and cooking tips. Make your meals as simple as possible and at the same time provide a variety of dishes at each meal. Presentation is everything! Instructions; Beat eggs. Beat in sugar. Add oil, vanilla and zucchini. Mix dry ingredients.Stir into egg mixture and beat well. Stir in nuts. Pour into two greased and floured 9" x 5" loaf pans. Bake at 350 F. (180 C.) for one to 1-1/4 hours. Rachelle, thank you for sharing! We hope you’ll be a frequent visitor. I am greatly enjoying reading this. I wish my mother, z”l, could read this, too; she was a big fan of Rachelle’s cooking. “dinner at our house as an elegant party, complete with table setting and flowers” – how wonderful! I hope my mother will share a newer recipe she picked up in Israel–stuffed artichokes. I’ll see if I can find it and will post it if I can. How interesting to read the mom’s interview after her daughter. I love the idea of eating out when Shabbat leftovers have run out. However to do this I’d need to ask for a payrise. I think the amount of sugar is supposed to be doubled in the recipe (there was an addendum). As to leftovers–my mother really makes a lot of food, so they don’t need to eat out until Wed. or Thursday! Shabbat lunch with you and Saul is always a highlight during our visits to Jerusalem! I will definitely try the Zucchini Bread this summer though my husband yearns for your mother’s Sour Cherry soup….